You can use WHMCS internal system module debug log in order to troubleshoot communication problems with the remote joomla site. It will record and display the raw API data being sent to, and received back from the remote system. Logging should only ever be enabled for testing, and never left enabled all the time. In order to activate it, please navigate to “Utilities” -> “Logs” -> “Module Logs” -> Click on “Enable Debug Logging“. This might indicate that the communication from Joomla to WHMCS is working, but Joomla (or the server that hosts joomla) is blocking the access. 5. Some kind of mod_security rule is blocking your request. 6. Avoid using special chars ($&?%) in your joomla user password, It can interfere with with the login post from WHMCS module. Error from WHMCS: You can’t acces with the user group. 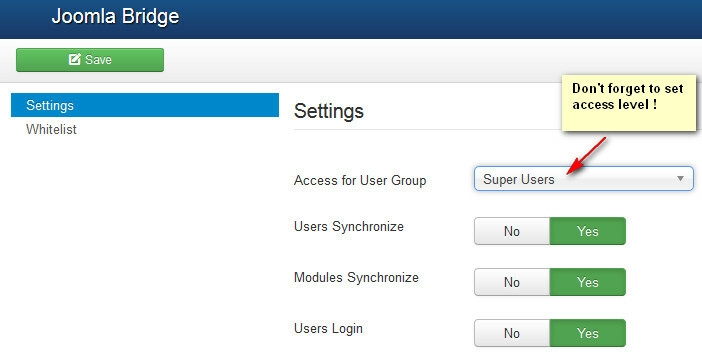 Navigate to “Components” -> “Joomla bridge” -> “Settings“, change access level to “Super Administrator“.